When in Spring 2010 ‘austerity’ began to re-appear on the European landscape as a concept, populating the headlines of newspapers and official documents to account for the massive cuts on public spending that European governments were just about to devise, not many, perhaps, had seriously considered the whole range of meanings that the term might imply for and disclose to European citizens, with its references to a ‘sternness’ and ‘severity’ of lifestyle, and, above all, to the ‘inessential’ that needs to be violently cast off from ‘public’ and ‘private’ life. In Italy, the battle over what defines ‘the essential’ went far beyond strict economic boundaries, traversing society in all its aspects, and even transgressing those very categories, public and private, that had begun to appear, themselves, as ‘inessential’ to those who opposed the necessity of austerity measures. Today’s Italian crisis is not the simple expression of the wider economic crisis of Europe, or south Europe in particular. It is the sign of a deeper and much more pervasive uncertainty, the expression of a shaking of the time-honoured cultural, social and political foundations of Italian society. In this precarious context induced by a struggle for the essential, however, one term re-emerged as indispensable, providing many with a new sense of direction, desire and sharing, ultimately assuming, like a boomerang effect, the ‘austere’ dignity of that which cannot be renounced: this is ‘the commons’, the concept and political practice that also informed ­ – among many other ‘acts’ of ‘critical’ significance in these years – Spatial Struggle, an event organised in September 2013 at Teatro Valle in Rome, in collaboration with the Oecumene project. The latter event was an ‘event’ in a political and transformative sense, allowing a few intense days of sharing, debates, change, creation, and political enactment among artists, researchers, activists or simple citizens who together ‘made’ the ‘experience of the commons’ in those days. Although a central concept for many, the commons only began to be widely acknowledged as a fundamental social practice in Italy following the 2011 Italian water referendum, which signalled the successful effort of citizens to resist, together with a law privatising water services in Italy, a more generalised attempt to privatise public services with an economic value. An aggressive campaign of privatisation had begun years earlier, but the recent necessity for austerity cuts provided a further legitimising expedient in that direction. Social practices based on the ‘commons’, however, are not simply the expression of a movement of resistance against the private exploitation of natural resources and public goods. What became immediately clear in Italy in fact, was that the defence of the commons meant at the same time the creation of a new kind of political and social bond. A political relationship beyond classes, beyond the traditional and formal idea of citizenship, beyond any identity logics of belonging. This is not to say that those political movements that assume the claim of the ‘commons’ as their foundation do not begin their ‘action’ as a form of resistance and response to the private exploitation and depletion of public goods. The 2011 movement certainly emerged in that way. But in its defence of the ‘commons’, it quickly expanded its range of action so as to extend the idea of common goods (beni comuni) beyond the sphere of natural resources towards what has been called the ‘immaterial’ commons (health, education, culture, knowledge, etc.). This included, naturally, those very cultural spaces in the cities (the occupation of Teatro Valle, the day after the water referendum, belongs to this category) that had been more and more targeted by privatisation campaigners. As acts of resistance and reaction, the practices of the ‘commons’ have an unlimited possibility of action in an unlimited capitalist market. As the problematic phrase ‘work as commons’ demonstrates, they can also affect the entire world of labour. But what is the ‘constituent’ perspective of these movements? What is it that lies within them, which is not only or not simply resistance and reaction? What is that distinguishes them from a mere defence of ‘the public’? One answer to these questions should point precisely to the ability of any struggle and political conflict over the commons to throw up and reflect new forms of socialisation: to express practices and actions of commoning. In this sense, as both action and practice, the commoning traverses contemporary reflections on the ‘being-in-common’, and the ‘commonwealth’ as social and political alternatives to the neoliberal ‘society of individuals’ in competition with one another. It stands as a new subjectivitywhich is alternative to the self-made man, the neo-liberal entrepreneur-of-the-self who, in the age of the debt economy however, can only take on itself the costs that the state and trade no longer assume. It is in the light of such a perspective that new possibilities are disclosed, for instance allowing a new ‘right to the city’ to emerge through the very claim that urban spaces, in their intimate link with culture, ‘must be defended’ from privatization; or, realising new forms of cooperation between those workers and citizens who both experience and oppose the ‘precarisation’ of work and the dismantling of the welfare state, thereby producing a new form of ‘commonfare’, which overcomes ‘workfare’ and ‘public welfare’. Each of these cases is far from determining once and for all what the ‘commons’ is, as the ‘commons’ constantly re-produces itself every time new forms of socialisation and citizenship are enacted. The practice and action of ‘commoning’ both precede and follow the ‘commons’, giving expression to it. 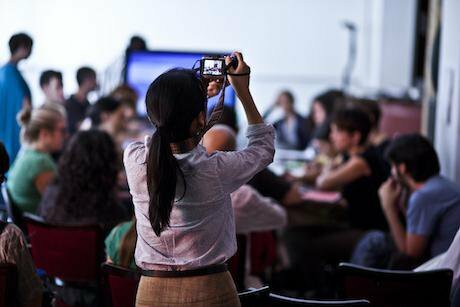 It is for such reasons that Spatial Struggles, the event this week’s guest feature on openDemocracy tries to recount, stood as an experience of the commons. Perhaps, for many who attended, the unfolding of that event might have appeared improvised, unexpected or disorganised, but if this was true, it is precisely because it was a form of ‘commoning’! 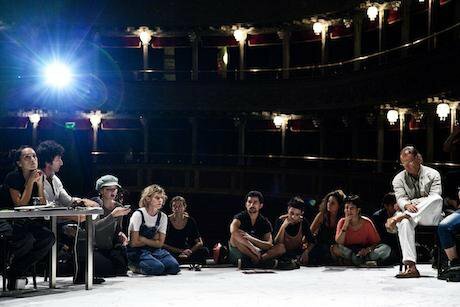 When normal citizens, artist and and activists at Teatro Valle met the researchers of the Oecumene team for the first time, the sensation that they were all moving from a quasi ‘nothing-in-common’ to a practice of sharing and common creation was strong. That such a transformative movement was possible became immediately clear when a tour of the ancient theatre was organised, which transmitted the magic of Teatro Valle with its anecdotes about the great artists who had performed there, included Mozart and Nobel prizewinner Luigi Pirandello, their ‘critical’ audiences, the city and its turbulent society who kept traversing that space in different ages, infusing it with an on-going quest for politics, art, ethics. It became immediately clear that Teatro Valle had never been simply an empty space to be occupied and defended from plunderers; it rather stood as a living space, a living theatre, to be safeguarded and nurtured, living because of the histories that have populated it and that not only survive through transmission from one audience to another, but also by the continuous enrichment of new contributions from those who keep sharing, creating and questing ‘in’ the theatre. This practice of commoning could immediately be sensed at the end of that tour: a new social bond had just been established – which kept on growing in the days that followed, through discussion after discussion, performance after performance, espresso after espresso! The research agenda of the Oecumene team, had been aimed at rethinking citizenship beyond traditional tropes in contemporary European thought, precisely exploring how people in different parts of the world creatively and inventively bring political acts into being and open up spaces for struggle and resistance against dominant regimes of thought and power. So perhaps it is no accident that it was in this social and artistic ‘scenario’, that profuse artistic, intellectual and political encounters occurred between ourselves and ‘Valle’. In this intense dialogue, we could think through what is essential about the commons at a time when austerity’s emphasis on scarcity seems to have rather effectively concealed the abundant possibilities of creation, and its relentless social and political production of new codes and new bonds. 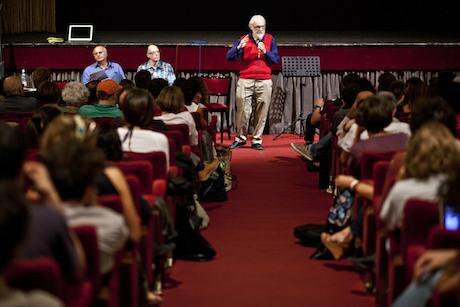 Indebted citizenship - an interview with David Harvey in Teatro Valle. Images courtesy of Tiziana Tomasulo.